Round one. After three years of coming to Stockport beer festival, I was pleasantly surprised that this year I made it to the opening day, when the beer supplies were not in danger of running out. First 1/3 had to be Quantum, AAA 5 %, style: American Amber Ale, launched for its debut at the festival by good friend of mine and Port St; Mister Jay Krause. 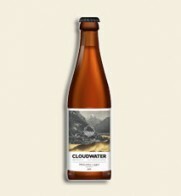 It was really good, deliciously hoppy with Bravo and Summit whilst staying true to its name with a rich Amber colour, it went down a treat and so I went back for another half. Ordinarily my rule is to move on, but this was extra special. Over to a nip on the dark side, which came highly recommended by the Port St crew Pied Bull, Black Bull Porter 5.2%, with an amazing sophisticated dry smokiness to it. I went from excellence to a mere ick with a nip of Off Beat, Way Out Wheat 4.5%, style: watered down coriander, so I plucked for 1/2 of the Outstanding, Silver Magnet 4%, brewed especially for the beer festival and The Magnet Freehouse, Stockport. This was a real good palate cleanser, on the nose a whiff of citrus, a really good example of a session ale that has something more complex going on. Next to a pass on by my sister, who was battling her way through. I had no problem with this amply malty Hardknott, Infra Red IPA 6.5% with Cascade and Centennial hops and Crystal malt leading to a rich ruby hue. 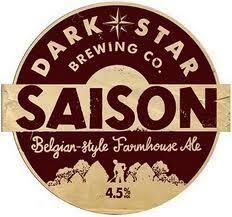 Moving nicely onto the dark, Summer Wine, Barista Espresso Stout 4.8%. I’m a big fan of Dark Star, Espresso 4.2%, so this had some to live up to; I was not disappointed as this coffee stout had everything going for it. It was bitter as decent coffee brewed with ground Arabica, dark and not too creamy, there was nothing forced about the taste. Last one for the night Acorn, Simcoe IPA 5%, always a nice move, this is the 4th in their second series of American IPA’s, golden in colour and taste. There were plenty more to try with 150 beers, ciders and perrys, they hadn’t put any Marble on yet and I like to try the Summer as it changes year by year. I never got round to some of the good old faithful brewery’s like Dark Star and Thornbridge, so I made up for this with a delightful Friday evening in Port St where they had on the exceptionally good Ramsgate, Common Conspiracy 4.8%: Amber American Ale. I tried a nip but alas it ran out, only to be replaced by Thornbridge, Sequoia 4.5%, which was excellent. I made up for Summer in bottle form, with Brooklyn, Summer Ale 5%, delightfully good on what felt like the hottest day of the year. 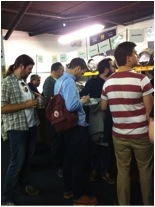 Large beer festivals are always a strange occasion, as they are most definitely about drinking the beer and the chances to talk about it are quashed by the masses. 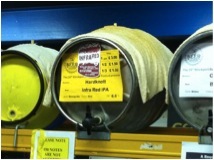 It was good to see a large selection of old and new beers on at Stockport that were more than your average. They had a wide variety of ciders and perrys, which although are not for me are great for those who prefer these to the ale. The next beer festival I will go to will be at The Albert Club in West Didsbury, as it was a real hidden gem last year and quiet enough to sit in the bowling green with time to ponder the flavours. There won’t be as many beers to try, but it’s free entry and definitely worth a couple of pints, 24th-26th June. 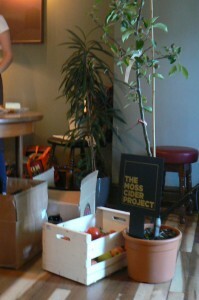 On Tuesday 24th of May we held our first ticketed event, an evening of Cider and Cheese with The Moss Cider Project. The room was set up beautifully, the guests filtered in and the fun began. After a brief introduction by the charming Dan Hasler, the tastings kicked off. Some expertly chosen cheese from Emma Cormack & Kate Ward matched the ciders put forward by ourselves. The Brie & Hovis with Dunkertons combo was my personal favourite, but many people would argue that. The ciders tasted covered all the bases. Firstly Dunkertons, a 7.2% Organic real cider from Herefordshire. Basically think summer orchards in a glass, medium dry with a touch of oak. Secondly Original Sin from NYC. A great 5.5% ‘hard cider’ from the most vibrant city in the world. 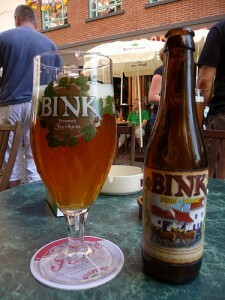 It has great bubbly mouth feel due to the champagne yeast and a light balanced flavour. Finally we tasted the Moss Cider, a hefty 6.5% that tasted like biting into a granny smith. The depth of flavour was really impressive. You could almost taste every apple pressed into it. The evening was finished off with a presentation about the story of Moss Cider. 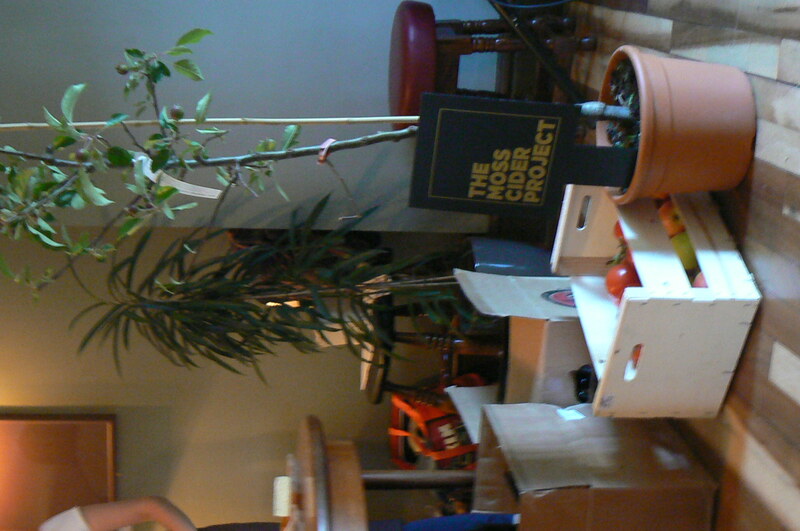 It’s a great community project that started in a back alley in Moss Side, the aim to mash unwanted fruit into cider and build community spirit, through a product everyone could be proud of. We are chuffed with how the event worked and how everyone seemed to have a great time. A big thank you to the people who came & enjoyed this great event with us & everyone who helped out. Here is a short video from Message Creative showing how much fun we had at the Moss Cider tasting event… here’s to more! Mosscider Tasting from Message Creative on Vimeo. 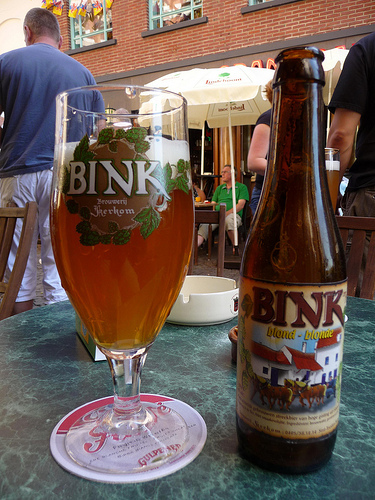 Belgium has one of the most diverse beer cultures in the world (perhaps now eclipsed by the USA but that’s for another time) and for many beer enthusiasts it is something of a mecca. Almost every beer style you care to mention is made in Belgium – and very often the Belgians got there first and have been doing it better and for longer than anyone else. With one exception.